Box Text: Wield the sword. Solve the puzzles. Live the journey. 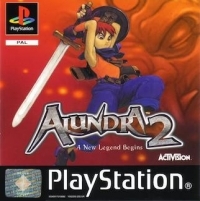 Alundra 2: A new legend begins. You are Flint, a renegade swordsman on a quest to free a kingdom from the grip of a sinister ruler. Through a land of hidden danger you wield your weapon, navigating an intricate story wrong with bizarre characters, brain-twisting puzzles and wild games. Beware! An even greater evil is about to be revealed. Journey through hours of immersive gameplay, set in a fully 3D world. Collect hidden puzzle pieces, rings, herbs and over 60 special items. Reveal the story through hours of unfolding cinematics. A complete new opening movie with a wealth of story background. Two difficulty levels. Fight a slew of mega-bosses and monsters in real-time RPG battles on land, sea and air. Swim, climb and jump to solve hundreds of action-based puzzles. Play 10+ mini-games to test your skills and increase your stats. 08-21-2014 nunocaires Box Text Wield the sword. Solve the puzzles. Live the journey. 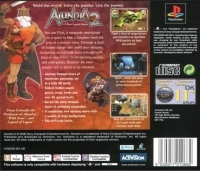 Alundra 2: A new legend begins. You are Flint, a renegade swordsman on a quest to free a kingdom from the grip of a sinister ruler. Through a land of hidden danger you wield your weapon, navigating an intricate story wrong with bizarre characters, brain-twisting puzzles and wild games. Beware! An even greater evil is about to be revealed. Journey through hours of immersive gameplay, set in a fully 3D world. Collect hidden puzzle pieces, rings, herbs and over 60 special items. Reveal the story through hours of unfolding cinematics. A complete new opening movie with a wealth of story background. Two difficulty levels. Fight a slew of mega-bosses and monsters in real-time RPG battles on land, sea and air. Swim, climb and jump to solve hundreds of action-based puzzles. Play 10+ mini-games to test your skills and increase your stats. This is a list of VGCollect users who have Alundra 2: A New Legend Begins in their Collection. 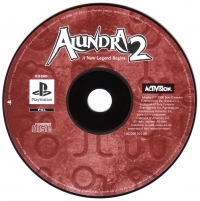 This is a list of VGCollect users who have Alundra 2: A New Legend Begins in their Sell List. This is a list of VGCollect users who have Alundra 2: A New Legend Begins in their Wish List.